Is your installed sales team certified to work on homes containing lead paint? Are your subcontractors? If not, any work you perform on such properties built before 1978 could be subject to five-digit fines. Is lead paint really that big of a deal? In 1991, the Secretary of the Department of Health and Human Services called lead the “number one environmental threat to the health of children in the United States.” In 2008, the Environmental Protection Agency enacted additional regulations expanding the lead paint rules to govern the renovation of residential housing and child-occupied buildings built before 1978 (the RRP Rule). Under the RRP Rule, contractors performing renovation, repair and painting projects that disturb lead-based coatings (including lead paint, shellac or varnish) in “child-occupied facilities” built before 1978 must be certified and must follow specific work practices to prevent lead contamination. Contractors could be affected if more than six square feet of lead-painted areas are disturbed. Built after 1978: Unlikely to contain lead-based paint. Even though only 24% of houses built between 1960 and 1978 likely contain lead paint, the RRP Rule must be strictly followed for all properties that qualify as child-occupied facilities. Also note that while the RRP Rule originally allowed a property owner to waive compliance by opting-out and stating that the property was not a child-occupied facility, the EPA quickly abolished that option because of the high potential for dishonesty. If you are still using a lead paint disclosure form containing a section allowing the customer to opt out, your form is outdated. Residential contractors also need their calculators to add up the increased costs for training and education, establishing dust containment methods (such as sealing off doorways and HVAC ducts with plastic), properly disposing of materials, and testing for “dust clearance” at the end of the project. A number of national trade associations outraged by these additional costs have opposed the RRP Rule and have even sued the EPA (without success). The importance of contractors understanding and complying with the RRP Rule cannot be understated. • In June 2018, Magnolia Homes, the company featured on the HGTV show Fixer Upper starring Chip and Joanna Gaines, reached a settlement with the EPA for alleged lead paint violations. As part of the settlement Magnolia Homes will pay a $40,000 fine and spend another $160,000 to abate lead-based paint. Magnolia Homes was also required to create and post a video on its website about lead paint safety: magnolia.com/lead-paint-safety. • A Kansas contractor who worked on a vacant apartment building built in 1922 incurred total civil penalties and costs of over $27,000. I question how a vacant property qualified as a “child-occupied facility” but I assume the EPA asserted that children would “regularly visit” there in the future. • A contractor working for the Alaska Department of Administration on the state governor’s house was fined $32,130 for failure to have the proper EPA certification and for failure to hire EPA certified subcontractors. One would think the State of Alaska might have verified whether it was hiring an EPA-certified contractor to work on the governor’s house. Keep in mind that common sense is not the yardstick for measuring if the RRP Rule applies. I once represented a contractor remodeling a house built in 1968. He threw carpet that had been installed in 2003 in the construction dumpster and was tagged by a building inspector for failing to properly dispose of it. The inspector said the 2003 carpet had been sitting in a 1968 house where lead paint flakes still could have contaminated the carpet. • Attend an EPA lead renovation class: Become certified in lead-safe work practices. • Apply for certification: The EPA’s website contains forms and instructions at: epa.gov/lead/getcertified. • Provide customer with “Renovate Right” pamphlet: For pre-1978 properties, give customers a copy of the EPA “Renovate Right” pamphlet. The pamphlet can be downloaded from the EPA’s website. • Obtain a receipt showing the customer received the pamphlet: EPA regulations required you to keep a copy of the receipt for your records. • Perform the lead-safe test: Test flooring finishes, baseboards, and shoe moldings. The EPA’s website has information on acceptable lead-testing kits. 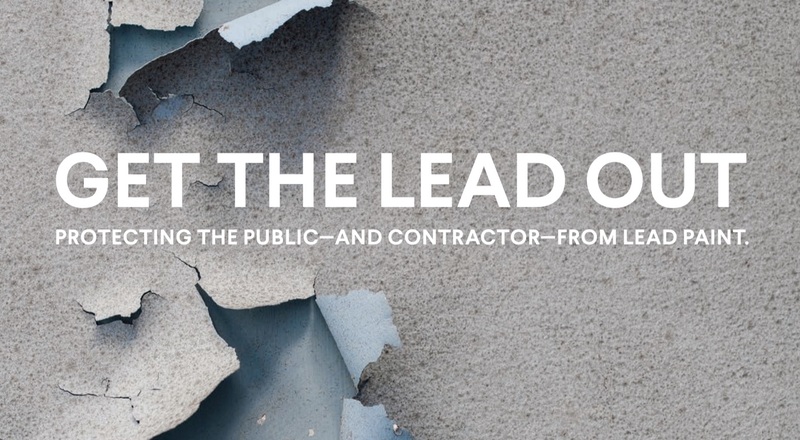 • If lead is present: Before starting any work, tell the customer about the presence of the lead paint, the required procedures, and the related costs. Note that you may choose not to perform the renovation or repair work. • Contact your insurance agent: Determine if you need additional liability insurance to cover lead paint renovation and repair work. • Keep your calculator handy: Calculate your additional overhead for compliance, or else you later might be adding up your fines and penalties. Virtually all relevant information about lead paint certification and abatement can be found on the EPA’s website.